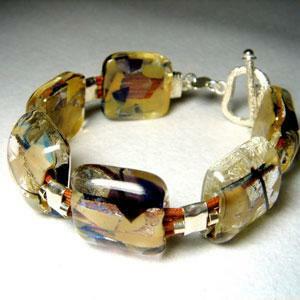 Stunning autumn look, with this fused glass stone bracelet. Enhanced by generous Sterling Silver connectors. Hand Crafted by Jana Sobelman, this Sterling Silver Fused Art Glass Bracelet is an absolute master piece in elegance and design. Generous large coloured Glass pieces, held together by sterling silver and silk cord.